Freshtone Samples features the work of producer musicians Matthew Corbett and Mike Wilkie who are best known in the world of samples for their work with Zero-G, including 'Sounds of the Seventies', 'Vocal Forge' and 'Vocal Foundry' which were all released to critical acclaim. Lost Tapes Volume 1 resonates with the textural sensations of an age, with that human touch – spontaneous and exciting. 43 choice cuts featuring the instruments, and the playing style of the era, with the gestures of soul, pure and funky, and sounds of the ghosts of pop's past. 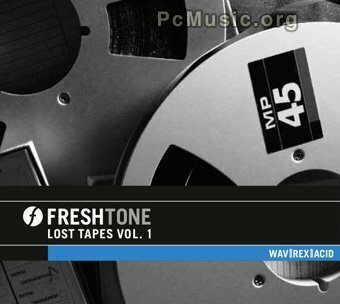 In WAV, Aiff, Acid WAV and Rex 2 format, Lost Tapes was recorded in a unique environment. The tracks were played on a wide range of sixties instruments from legendary manufacturers such as Burns, Baldwin and Dan Electro into vintage Selmer and Vox amplification.